For a full list of ministry tools and more information, please visit their website here. Galcom’s vision is to see the Gospel of Jesus Christ preached to every tribe, tongue and nation. Galcom exists to give help and tools to the missionaries that have answered the call of Christ to “Go into all the world and preach the gospel to every creature.” Mark 16:15. By using radios, missionaries are able to multiply their impact and reach more people and a larger area with the Gospel every day. Their mission is to multiply missionary impact through audio technology. Their strategy is to provide durable technical equipment for communicating the Gospel worldwide. This is the next generation in missionary technology. 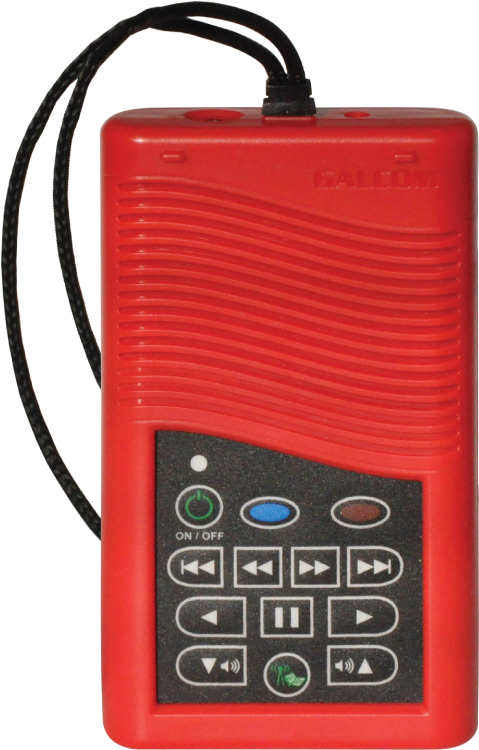 Galcom has combined their Go-Ye radio with the audio Bible to create the ImpaX, a solar-powered, fix-tuned radio and audio Bible all in one. Perfect for oral cultures and areas not serviced by 24-hour Christian broadcasting, the ImpaX has a simple button that toggles the player between radio and audio Bible functions. Galcom can load custom messages from the 8,000+ Gospel presentations in their audio library. Introducing the new Go-Tell solar, fix-tuned radio. Upgrades include a new sleeker design; improved radio reception; and multi-band, multi-station options for ministries with access to multiple Christian broadcasts. Go-Tell radios are tuned to any frequency on the dial at the request of partnering mission agencies or churches. On average, each radio is listened to by 10 people, greatly multiplying the impact of the missionary outreach. Go-Tell radios are a great tool for short-term mission teams, allowing them to leave a Gospel witness long after they’ve left. Go-Tell radios also allow those who can’t travel overseas to send a pocket sized “missionary” in their place. The Cornerstone Transmitter enables low-power FM-radio transmission for churches, conferences, or speech translation. Setup and monitoring of all features is easy using the touch-screen LCD display. The backlit display is viewable in all lighting conditions, from direct sunlight to a darkened room. When power lines are down, how can victims receive vital information on where to find clean water, food, or medical attention? Galcom has distributed thousands of solar-powered, fix-tuned radios to supply people with the means to hear important emergency broadcasts. What happens when broadcasting operations are down as well? 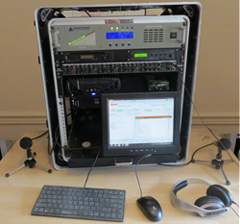 Introducing the OmniStation, an all-in-one solution for emergency broadcasting. In less than an hour, this microphone-to-antenna solution can be on the air. Main studio and broadcast components are contained in a rugged air shippable box (2 box option). Comes with high-gain omnidirectional antenna and collapsible mast. Runs on 110/230 AC, 24 VDC, or solar. 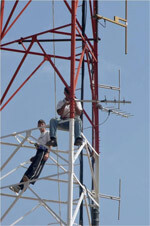 Depending on circumstances, Galcom uses various tower solutions, from “masts” to freestanding and guyed towers. Galcom can help determine what type of antenna will maximize the broadcast range for your area. Propagation studies are done to show potential range over a given landscape. The radio-transmission antenna is as important to quality transmission as any other part of the radio station. Galcom’s Cornerstone contains a basic studio with on-board mixing and inputs for mics, computer, MP3 or CD. This is great for missionaries involved in other work, enabling them to air pre-recorded programming or limited live broadcasts. Set it and forget it. 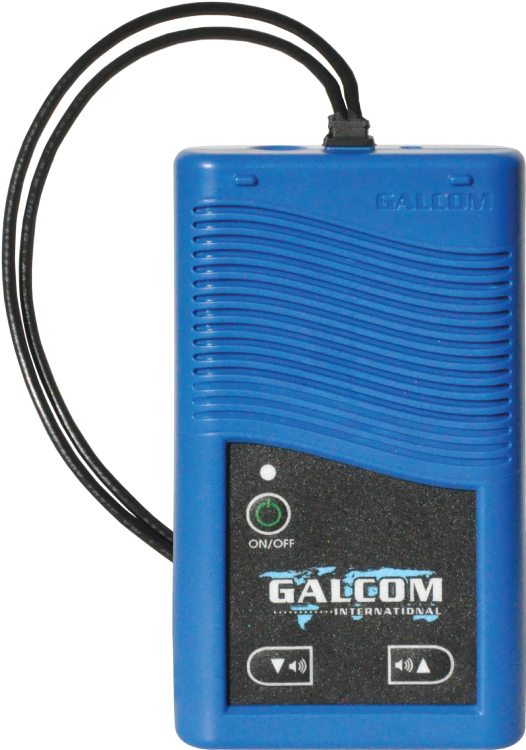 Galcom can also source the best value (high-quality, low-cost) equipment available on the market for larger “professional” studios. A simple solution to stream live radio over the internet. 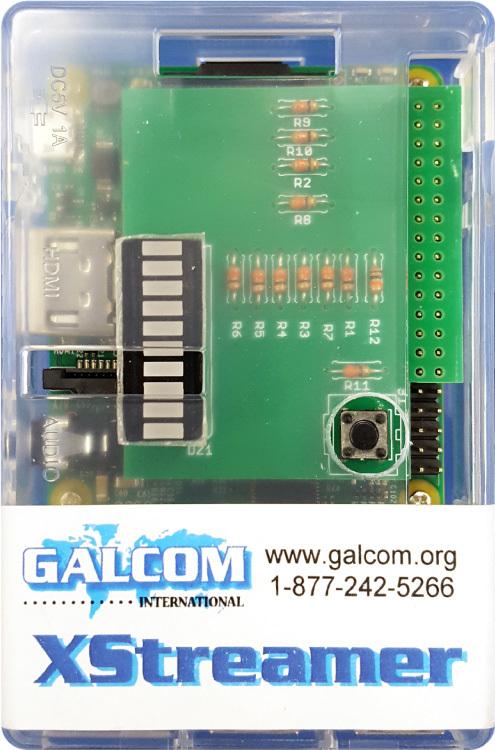 Using Raspberry Pi* technology and hosting the streams on Galcom’s server, missionaries can reach their audience through their smart phones, tablets, laptops or computers through the internet.